Synopsis (from GR): Beat movement icon and visionary poet, Allen Ginsberg broke boundaries with his fearless, pyrotechnic verse. This new collection brings together the famous poems that made his name as a defining figure of the counterculture. 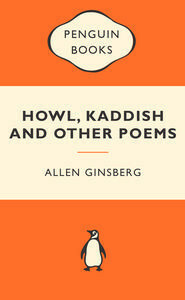 They include the apocalyptic "Howl", which became the subject of an obscenity trial when it was first published in 1956; the moving lament for his dead mother, 'Kaddish'; the searing indictment of his homeland, 'America'; and the confessional 'Mescaline'. Dark, ecstatic and rhapsodic, they show why Ginsberg was one of the most influential poets of the twentieth century. Disclaimer: I have never reviewed a collection of poetry before. I am not a poetry person - I have always preferred prose. Aside from a brief interest in Banjo Paterson when I was about eight, and an ability to recite a handful of lines from Dorothy Mackellar's 'My Country,' my poetry knowledge is incredibly lacking. I read this book for Brain Soup Goes Gilmore - it's National Poetry Month over in the US, so naturally, a collection of poems was picked! I've had an interest in the Beat Generation for awhile, although if I'm being honest Kerouac and Ginsberg intimidate me - I've been afraid I wouldn't "get" them - so I'm glad Brain Soup pushed me to pick up this book. Ginsberg writes beautifully - he's passionate, and opinionated, and he obviously pushed boundaries at the time. He can really write a sentence. There are a lot of allusions to Judeo-Christian texts, and Greek mythology, as well as political and cultural references. I'd love to reread this collection again after I've done some deeper research and see what I think of it afterwards, because I'd probably appreciate this collection a lot more. I think the hardest one to read was 'Kaddish,' which was an attempt to mourn his mother. In telling the reader his memories of his mother, Ginsberg gives you a look at his childhood - you feel his pain, his suffering, his disappointment in his parents... there's a melancholy tone to this poem that comes not just from the death of his mother, but the feeling that he deserved more from his parents as a child, and the guilt he feels because of it. The description of his childhood experiences is painfully good, and will leave you feeling emotionally exhausted by the end of it. I was left feeling confused and empty by the time I'd finished - probably how Ginsberg felt as a child. 'Howl' was another one I really enjoyed - it really set the tone for this collection. It's a poem I'd previously known by reputation only, used in an obscenity trial in the late 1950s due to its references to illicit drug use and homosexuality. It was an intense read, and a fascinating attack on the hypocrisy of the time. 'America,' 'To Lindsay,' 'To Aunt Rose,' and 'In the Back of the Real' were also good reads. That said, there are some poems I read ('The Lion for Real,' for example) and I just went "um, what?" I don't know if I was missing what Ginsberg was trying to say, or if he just wrote them in a drug-induced haze and nobody is going to get it. All in all, a nice introduction to the Beat Generation and poetry in general. I'm definitely eager to read more!